Go ahead and get creative. Vermont author Deborah Lee Luskin arranged with the Newfane Country Store to ship signed copies. By taking this step, Luskin brought business to her community, offering something special--a signed copy--in the bargain. My new book isn't out yet, so I have pre-order links up on my website. I've included links to six vendors, including IndieBound. IndieBound is a collective for independent booksellers, meaning that buyers are asked for a zipcode and then directed to a nearby store's "buy" page for your book. 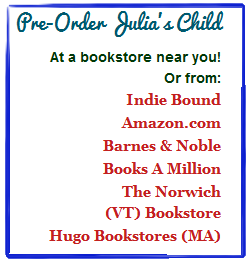 Two of the vendors I've included are bookstores that have offered to hold events for Julia's Child. It's the right thing to do. Thanks! I never understood about affiliates. This was helpful. This is so helpful, thanks. Maybe it's because I'm going through all this a couple of months behind you, but your posts are always so timely! Thanks, this was really helpful. It's a good thing we're friends. Because I'm gonna need to go over that affiliate stuff again, verrrry slowly. . . Thank you Donna, Petrea & Claire! And hang in there, Rosemary. We'll get there. You don't mention Smashwords. They also have an affliate program and the percentage is set by the author when they upload their book. And is changeable at any time. Hi I just found this post. Once I have been accepted by these affiliates is there a wordpress plugin you would recommend that shows up all of these options in one place? Many thanks.